Catholic News World : Wow a #ProLife Pope Francis Prays at Cemetery of Unborn Babies - Watch the Video and Share! Wow a #ProLife Pope Francis Prays at Cemetery of Unborn Babies - Watch the Video and Share! 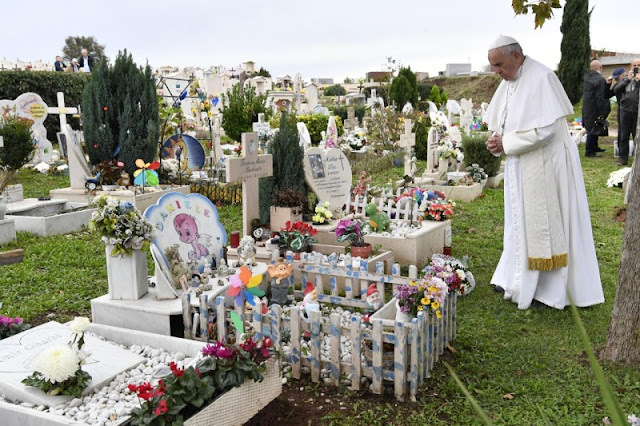 Pope Francis visited Laurentino cemetery in the Roman countryside. The cemetery was consecrated on 9 March 2002 by the then Cardinal Vicar Camillo Ruini. On January 4, 2012, the "Garden of Angels" was inaugurated: a green area of about 600 square meters dedicated to the burial of unborn babies . Surrounded by a hedge, the Garden is located in front of the " Children’s cemetery" and is symbolically guarded by two large marble statues depicting two angels, a symbol of innocence and purity. The chapel of the Risen Christ Laurentino is the only cemetery in the Rome with its own chapel .